Order your Chauvet DJ EVE F50Z Stage Light from AMS and enjoy 0% Interest Payment Plans, Free Shipping, Free Extended Warranty & 45 Day Money Back Guarantee. 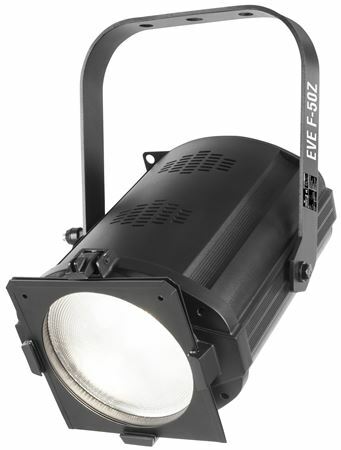 An LED Fresnel fixture, the EVE F-50Z shines a soft-edged, warm white spot and features D-Fi USB compatibility for wireless master/slave or DMX control. Manual zoom gives you the flexibility to project from any distance. EVE F-50Z includes holders for glass and steel gobos as well as a gel frame. You can operate EVE F-50Z in standalone mode eliminating the need for DMX control and you can save time running extension cords by power linking multiple units.